The DJB & RDT52 system is the incorporation of the digital junction box(DJB) and the weight terminal RDT52 which is especially designed for the DJB. 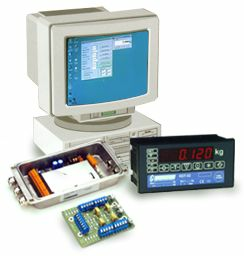 This system combines all the features of the two components; the digital junction box converts the analogue signal of the load cells into digital, which is then transmitted to the connected RDT52 weight terminal and changed into the weight displayed on its screen. figuration.The RDT52 remote display terminal has the attribute to either work in master mode whereby it may poll up to 30 DJBs connected in a network or in slave mode whereby it will only display information from a selected DJB.